Exercise, along with medication and a well-balanced diet, can help seniors control their blood sugar levels and prevent some of the complications associated with diabetes. Proper exercise can also help seniors living with diabetes enhance their quality of life. Oakville in-home care experts suggest your elderly loved one try to include some or all of these exercise types in his or her daily routines. When your loved one participates in endurance exercises, he or she is boosting the health of various organs within the body such as the heart, lungs, and respiratory system. In addition to keeping these systems healthy, endurance exercises can also help your loved one improve his or her overall health and delay the progress of diabetes by helping with blood sugar control and increasing the body mass index. 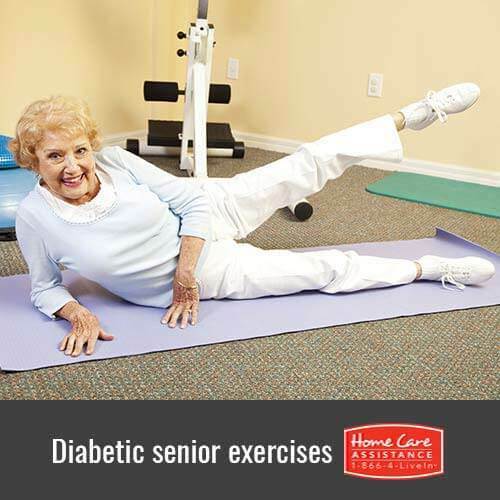 Seniors who have diabetes or want to prevent diabetes should do stretching and flexibility exercises on a regular basis. Stretching and flexibility exercises burn calories and increase muscle tone, helping slow down the progress of diabetes. Since stress can make diabetes worse, stretching should be done regularly to help reduce these feelings. These exercises also help build muscle to prevent slips or falls. These exercises can help seniors with diabetes boost the health of specific body parts. For instance, some balancing exercises increase a senior’s overall balance, while others build muscles in the arms or legs. These fluid movements can strengthen your loved one’s balance, lower stress levels, reduce blood sugar, and boost nerve function. Making healthy lifestyle changes is one of the best ways for your loved one to address concerns related to diabetes. If you want to learn more about how an expertly trained part-time or live-in caregiver in Oakville can help your loved one maintain a regular exercise routine, reach out to Home Care Assistance. To schedule a free consultation, please call one of our qualified Care Managers today at (519) 590 2792.